Directions: Read the summary, watch the video and answer the discussion questions. You may want to read along using the transcript here or turn on “CC” closed-captions. Summary: Easter Island, or Rapa Nui, the Polynesian name of the island, is located 2,200 miles off the coast of Chile. The island is home to 6,000 residents and the famous moai ancient statues. Polynesian inhabitants arrived on Easter Island around 1200 AD, and created a thriving society, including the moai. It’s near the “trash vortex” in the South Pacific where floating waste constantly washes ashore. Local officials estimate the growing population is producing more than 20 tons of trash per day. While the island’s residents experience the consequences of the world’s waste problem daily, they continue to work on solutions to protect their ancestral lands. 1. Essential question: Why is plastic so harmful to the environment? 2. 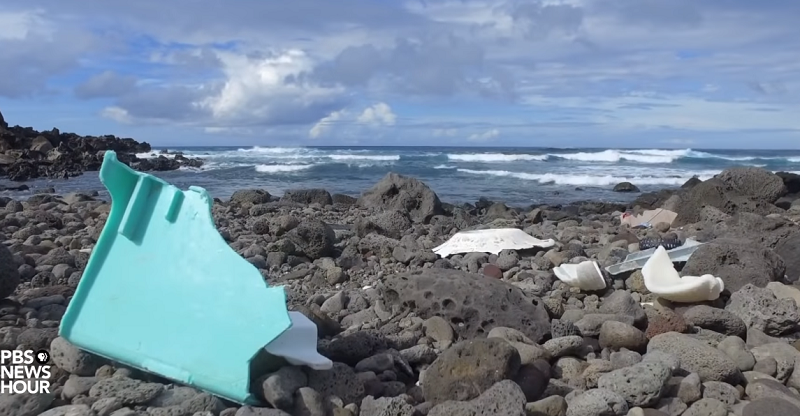 How will the trash washing ashore affect Rapa Nui’s tourism industry? What can residents of Rapa Nui do to protect their coasts and surrounding waters? 3. Michael Reynolds designed the Rapa Nui School of Music to include sustainable infrastructures such as solar panels and rainwater collectors. What impact do sustainable buildings have on the public’s awareness of their environment? 4. What are the benefits and drawbacks of growing tourism for a small, remote island? 5. Preservation of the island’s culture is important for many residents. What impact does Rapa Nui School have on the island’s ability to preserve its culture? Does pollution affect your community? How so? 6. Media Literacy: How do news outlets cover plastic consumption and waste? Do they cover the issue in relation to how it affects individuals? Use the website Allsides.com to help you research how news organizations cover the environment. Choose at least three different news outlets to examine. 1. Watch the video, “Can Easter Island’s treasures withstand storms of climate change?” below and read along with the transcript here. 2. Watch the NewsHour video Plastic lasts more than a lifetime, and that’s the problem on how plastic has long-term effects on the environment. Why is it so difficult to remove all the plastic from our oceans and shores? 4. Twitter chat: How do we fix the planet’s plastics problem? 5. Watch the video or follow along with the transcript here: How can individuals combat plastic pollution?.